There are many definitions available for mentoring, some of which stress the importance of the mentor’s experience and seniority. Our view at Motion Learning is broader, and for us mentoring is a relationship in which experiences are shared and questions asked and answered for mutual benefit and growth. We believe this encompasses the various types of mentoring relationships we are seeing in the workplace. However we recognise that this might lead one to see mentoring and coaching as similar activities, and in fact they can be. Mentoring relationships can take many forms. This purpose, or series of purposes needs clear objectives and methods of measurement, so that all parties can see the on-going value of the programme. Mentoring can be incredibly powerful, but equally, can have disappointing results. Much depends upon the culture of the organisation in which it’s taking place. For mentoring to succeed there needs to be a broad and deep understanding of the value of learning and development, and a willingness at all levels to invest time and energy in its achievement. Supporting career development and progression needs to be seen to be central to the purpose of managers at all levels. Honest communication and an openness to feedback needs to be demonstrated throughout the organisation from the very top down. 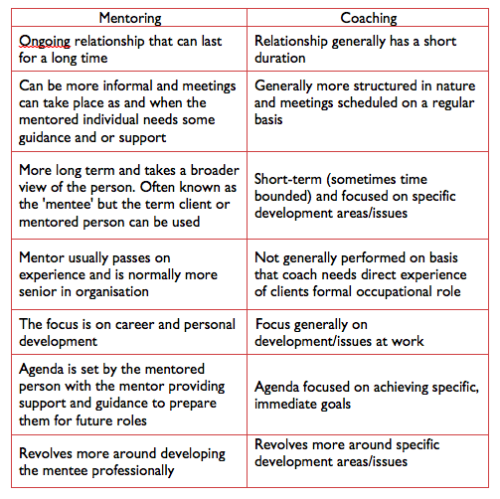 In our experience, before engaging in the practical work required to introduce a successful mentoring programme, these two elements need to be explored and senior management and HR need to be confident that the right conditions are in place to give the programme a fair chance of delivering on it’s aims. The aim at this stage is to build rapport, identify the purpose of the relationship, discuss and agree any specific objectives, consider ways to review and measure the success of the relationship, and, if desired, document the above. There follows a series of meetings and/or conversations, during which the mentor will prompt the individual to explore issues, ideas and work, and to identify solutions and appropriate actions through questioning, listening, problem solving, feeding back and challenging. Depending upon the initial agreement, a number of reasons can bring the mentoring relationship to a close. It may be the objectives of the relationship have been achieved, roles may have changed, learning may be complete or a closer relationship may be reached. Whatever the reason, its useful to ensure the relationship is reviewed, taking time to identify learning and progress and agreeing any further actions for either party.